“Touch points you are not afraid to touch” with our restroom power sanitation. 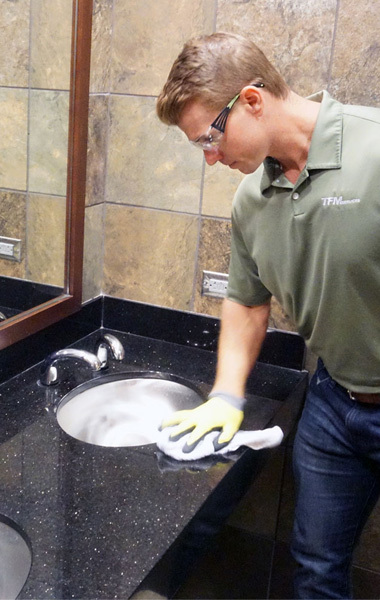 Far more than simply spraying and wiping surfaces in your restrooms. TFM employs the use of a pressurized disinfecting machine to douse every inch of the restroom. TFM trains our team the importance of allowing adequate dwell time to properly disinfect all surfaces. All soiled liquids are extracted and every surface is hand polished. Years ago our largest customer needed a cost effective solution to renew the appearance of several hundred of their restrooms. TFM purchased equipment, trained employees, got to work, developed a tried and true program and turned those restrooms around. Your facilities and all the individuals in them need fresh sanitary restrooms, ones that do not deter return business.